I had someone ask about the modifications for taller riders, or riders who wanted their feet extended more. 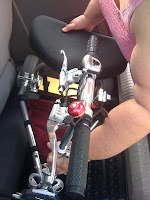 The seat can be put in a higher position by using spacer rings provided with the TravelScoot. 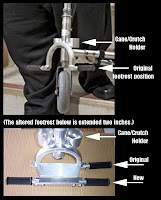 The top picture on the left is a picture of a modification Hardy can make to a scoot to extend the footrest by about two inches. The second photo is my attempt to explain what you're seeing in the first picture. 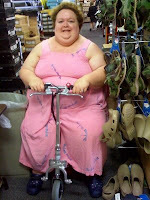 Big As TEXAS and my Super Scoot! On Saturday I led a workshop where we gave a demonstration of the TravelScoot. The best part was letting anyone who wanted to to take a test drive. It's so fun to see the absolute delight people get out of riding it. Even better was hearing folks talking about the ways they would use their scoot. They talked about using it to go places with their spouses/partners (like on a vacation that required lots of walking), to see the Smithsonian, or even to grocery shop. I also folded it up and passed it around the room so they could see how light it is to lift. Every person who tried was able to lift it. The picture is of me lifting it out of the back of our Honda Odyssey. This was my first opportunity to take my TravelScoot to a hotel convention. It was easy to take into our hotel room, and very easy to take in the elevators. Bigger scooters that I've rented for conventions in the past have been a problem when it came to getting on or off an elevator. This one wasn't at all. I was also able to take it directly into the restaurants and meeting rooms and park it near where I was sitting. When we left the hotel on Sunday evening to go out to a restaurant I put it in the back of our van and took it with me. I didn't need it at the restaurant, but I had it for when we got back to the hotel. We've nicknamed it the "Super Scoot" because it's small and mighty. Alan and I have a Honda Odyssey and I wanted to show you all how well the TravelScoot fits in the back. What you're seeing is a picture of it in the well. 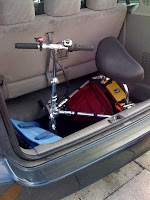 This is an area intended for cargo, or the third row of seats fold down into it. My sister Rae and I went to a "trash and treasure" sale that was held in an old department store building. It was PACKED with what seemed like miles of tables and displays. My TravelScoot fit anywhere I could have walked. Later on we went to Shoe Station. Rae took the picture of me squeezing between a garbage can and a hanging display of shoes. It might look tight, but I made it through just fine. A car pulled out right in front of me just as I was going down a ramp, and I'd like to report that the brakes work just fine! 3 1/2 years ago my husband had two heart surgeries and was in intensive care for a month. He has fully recuperated, but the experience gave me one more reason to want some sort of scooter so in an emergency situation how far I'd need to walk wouldn't be a concern. Well, who knew the situation would arise so soon after my TravelScoot? A dear friend of ours is having her aeortic valve replaced, and last night she told me how important it was to her for me to come visit her in the hospital. The hospital she's at is huge, having been added on to many, many times, and it's a hike to get anywhere from the parking area. Now I don't have to stress over going there. My scoot made it easy for me to tell her I'd be there. In the last week I've also used it at Albertson's to buy picnic supplies to take to my mom's nursing home, and at Fresh Market, just to pick up some groceries. I had a moment in Fresh Market where I wasn't thrilled about needing a scooter, but then I remembered how wonderful independence is! I love my TravelScoot.